With the weather being so changeable we haven’t managed to get our ducks out racing yet! We had our fingers and toes crossed for good weather but alas, the River Almond was too high to send the ducks out swimming. Instead, we had a bunch of trees to plant for the event and went along to do that anyway so they wouldn’t perish. 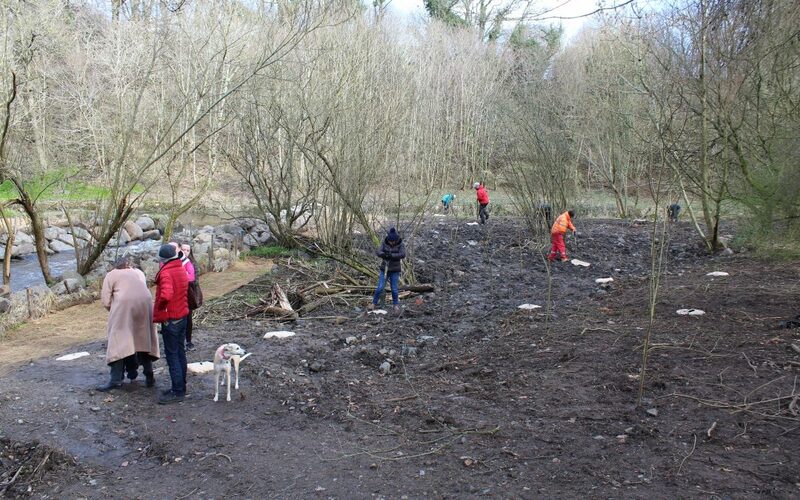 The Forth Rivers Team and a few passers by and volunteers braved the weather to plant the trees in the bare muddy earth next to the new bypass channel at Rugby Club Weir. We chatted to a few members of the public who saw the activity or who had come along to see our ducks, and reminded them to come along when we rescheduled it! 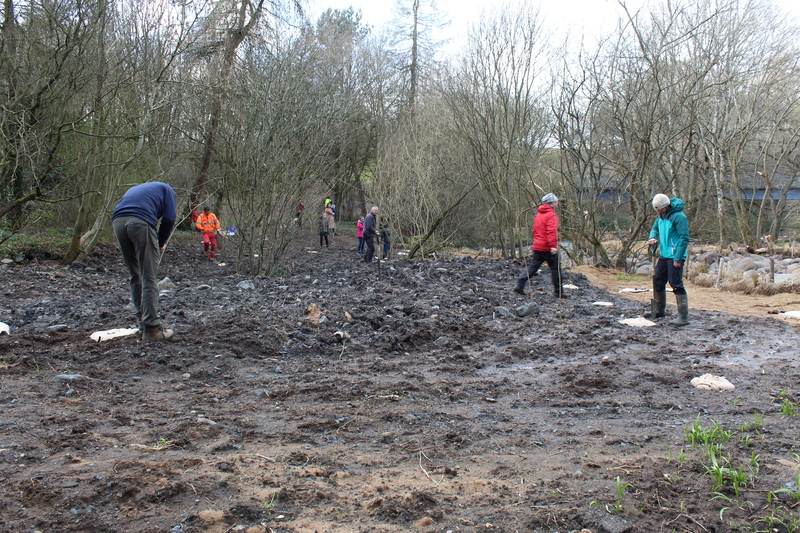 Around 40 trees suited to wet areas were planted next to the river to help stabilise the bank, replace some of the trees that were removed during construction and create new habitat along the Almond. Planting trees next to rivers is a great way to stop riverbanks from collapsing while providing shade for the river (keeping it cool) and adding nutrients to support lots of different animals and plants! We are a big fan of trees next to rivers and are always looking out for places that need some. Thanks to everyone who came along to plant a tree or two, or just to chat to us, today on the banks of the River Almond. We hope you can make it along to the duck race when the water levels have returned to normal! Foraging – walking, gathering, eating. What’s lurking in your river?